Gang, we are at it again and today we will be discussing best vintage irons. Yep, in this best vintage irons review we will be looking into irons that have stood the test of time and can still hold their own against the best and most tech advanced irons in the game. It’s safe to say that everyone of these irons falls into the category ‘oldie but goodie’. Let’s dig right in! Some of the irons on this list are two decades plus years old and are still ranked among the best. Irons such as the Ping Eye 2’s, Titleist DCI’s, and the Hogan irons are still some of the most favored irons by players. I find myself always coming back to my Ping irons and would rank them as the all-time best. That, and the fact that they are affordable, unlike these bank-breaking new irons. Simply put, these are great performers and available at a great price. Only con, which also happens to be their best attribute is their unforgiving nature which allows for more playability. This and the low tech in these irons are the only downsides. That aside I award them all a 5* rating (Okay a 4* plus rating). 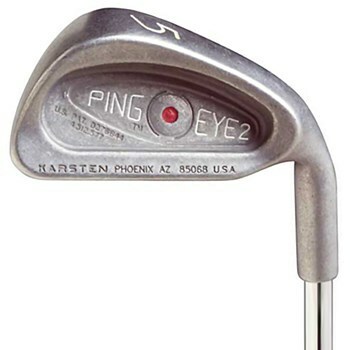 Kicking us off as the ultimate best vintage irons are the Ping Eye 2’s. These irons are the all-time best. The Ping founder, Karsten, surely was a visionary and by producing The Eye 2’s, he cemented his legacy as one of the best iron designers. Simply put, irons comparable to the Eye 2’s have been produced, but none exists that are better than these. The Eye 2’s which were produced in 1982 and ruled the golf industry for the next decade, came with a large cavity back that allowed for maximum perimeter weighting. The extreme perimeter weighting enlarged the sweet spot making these irons easy to hit. The Eye 2’s are for the mid to high handicapper as they offer the forgiveness these players need. 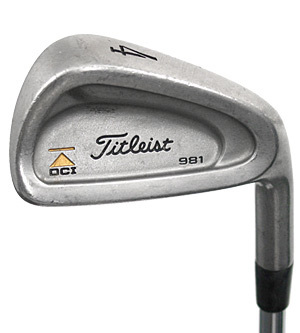 Coming in second on this list of great vintage irons are the DCI’s. This was a series that was produced by Titleist from 1990 to 2003. It was difficult to pick any one of the DCI’s and claim it’s better than the other. They all were and still are some of the greatest irons but I had to settle on the 981 irons. Guess it would be correct to say that the 90s were the DCI era. The DCI’s have a flexible graphite shaft, are easy to hit, and are consistently accurate. The 981’s, although meant for average golfers, are better suited for pro golfers. Guys who will consistently strike the ball dead center. The 981’s have a cavity weight shelf and a progressive offset which offers a bit of forgiveness. If you can strike the ball on the sweet spot, then you will have great distance and control. However, mishit these irons, and you risk sending your playmates looking for cover and probably spend the next 5 minutes looking for your lost ball. 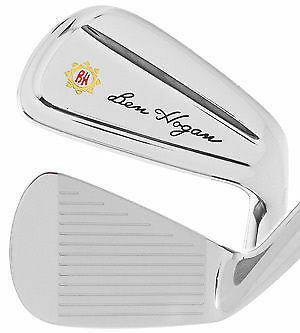 For those who were golf fans back in the 60s to the 90s, you remember the Hogan irons, right? These were some of the all-time best (the end all be all of the golf irons) before Callaway bought and killed the company. Ben Hogan surely is a legend in the golf industry. Good news, though, Hogan irons are back. 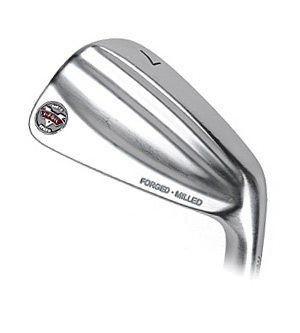 Away from that, the Apex 1998 irons, in my opinion, happen to be the best irons Hogan ever produced. They combined all the best attributes from the 88 and 94 apex iron and the result was (simply put) a ‘fantabulous’ iron which is the Apex 1998. These Apex irons have the feel and performance of a blade but incorporated into the most playable design available. Beautiful with flawless workmanship, with pure, soft, and solid feel. Though a bit pricey, they are worth every penny. They also won the Ace Group Classic with Bernhard Langer. They are that good. Though not as vintage as some of the irons on this list of best vintage irons, the MacGregor, which was produced in 2005, had to make this list. They are irons with a really unique look and great performance. MacGregor went with a 100% satin-nickel-chrome finish which will not blind you at address. The MacGregor M675 are blades with a progress/variable muscle-back. That is, the muscle-back gets larger as the irons become longer. Small muscle backs from the 6 iron to the PW and large muscle-backs on the long irons. Much unlike the other 3, these irons incorporate a lot of tech. The most noticeable being the V-foil speed technology. I.e. using a harder metal on the center of the face and a softer metal on the sides. The softer outside metal results in more feel and power for off-centre strikes. In the long 3 and 4 irons, there are internal tungsten weights in the back of the heel and toe. These help lower the Center of Gravity (CG) resulting in easy to launch irons. Another noticeable tech in these irons is the difference in heads. In the long irons, MacGregor used 1045 carbon steel which is harder with low spin and more distance, while in the short irons they used 1025 carbon steel which is softer with more feel, spin, and distance control. However, despite all the tech advancement, these are not your average player irons. They will definitely make you pay for your striking sins. It’s undeniable that modern irons are easier to play and the technology that is currently available goes a long way in improving our game. On that note, I have nothing but respect for players such as Ben Hogan who made playing these vintage irons seem like a walk in the park. It’s not. The irons listed above happen to be the best vintage irons of all time. The fact that some have won in tours just goes to prove that. So, if you are a purist and interested in vintage irons, grab yourself a set of one of these. May the fore be with you!